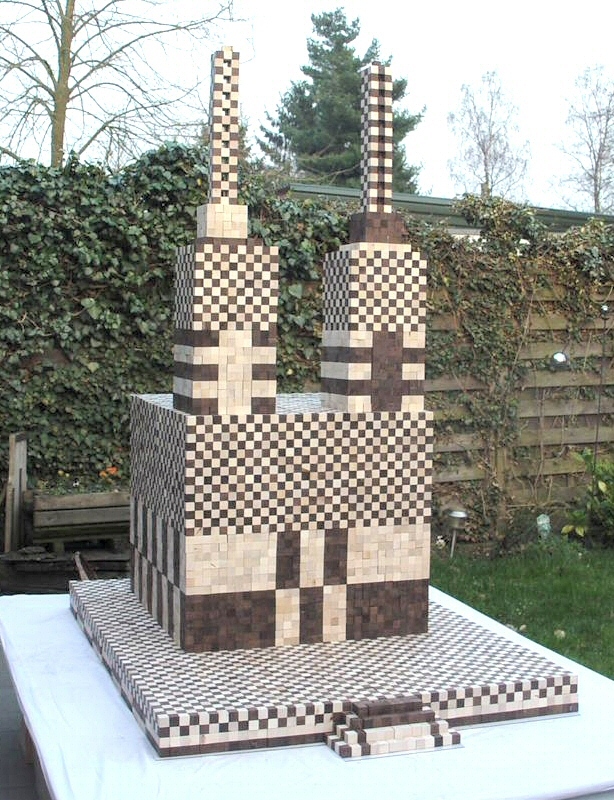 for Jan Zoon's Polycube Pinnacle: "Notre Dame"
Jan Zoon had been playing with pentominoes since 1976, when he wrote his first solving program as part of a math assignment. He moved up to pentacubes in 1983. He kept updating his solving program, "Cube Syndrome", to handle ever larger polyominoes and larger-order polycubes, right on up to the octocubes. In November 2009 he built twin towers (at right), to dedicate them in memory of the 9/11 event. They used four complete sets of pentacubes. As he continued to build, he found that the towers could be atop an even larger structure, and together they became the cathedral of Notre Dame. The lower block is composed of four complete sets of heptacubes. The white and black heptacubes are set in blocks of 31, placed to alternate each other. They form the lower half of the big block. 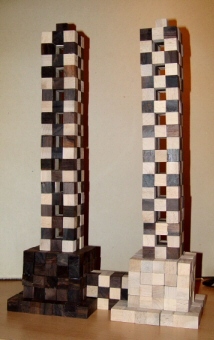 The upper half of the big block is composed of the same heptacubes, but now as one set of brown/white and the other set of white/brown pieces. The middle part is composed of four complete sets of hexacubes. Again two sets: one black and one white in cubes of 10x10x10 with one additional tetracube. Here the cubes are also formed out of alternating sub-blocks which are placed so you can see how they are built. On top of these cubes you see the cubes formed by the sets of white/brown and brown/white hexacubes. The upper part [towers] are my 11 September memorial. The towers are composed of four complete sets of pentacubes. The lower structure again has white and brown pentacubes. Above them are the white/brown and brown/white pentacubes. Jan thanks his collaboratorsPatrick Hamlyn, Ekkehard Kuenzell and Bob Harrisfor packing results used in building his biggest creation. Here is the magnificent final result as set up in his garden with help of a friend, from sub-blocks that had been waiting in his garage for a fair-weather day. It contains 45178 cubes: 2x1(1), 4x1(2), 4x2(3), 4x8(4), 4x29(5), 4x166(6), 4x1023(7), and 4x369(8). "Awesome" doesn't begin to describe it. We believe this structure to be the largest polycube figure ever built. Congratulations, Jan, for the unbelievable task of solving it and, even more amazingly, of having handcrafted all 7438 individual pieces. 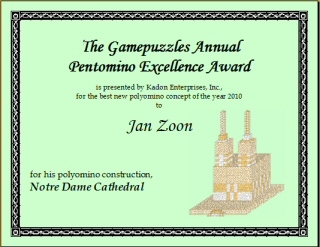 In recognition of this achievement, Kadon presented to Jan Zoon the Gamepuzzles Annual Pentomino Excellence award for 2010. His prize was a set of ceramic mugs with a picture of his design on them (shown at right) and a certificate, shown below.